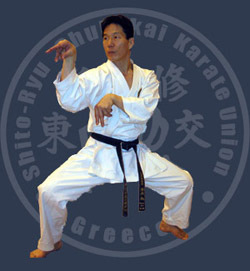 Born in 1950 in Saga prefecture, Mr. Kamohara began training in Karate in his early days at Osaka University. In his fourth year at the college he was made Osaka University Shukokai Kumite Team Captain. The team comprised some very famous Shukokai stylists including Yoshinao NANBU and Ryoichi TSUKADA. In the early 1970s, Mr. Kamohara travelled to England as a member of the Japanese team for Karate competition against England. Shortly afterwards Mr. Kamohara returned to Europe, and was based at the European Shukokai Headquarters in Brussels. Mr. Kamohara later moved to France further promoting Shukokai, and is now based in Chartres, near Paris.